I like Karna’s character in Mahabharata. He always acted like a human and always kept his words. Whatever happened but he never dishonored his own words. And he is one of the greatest archer of all time. তাই তো, পরিচয় দেয়নি জন্মদাত্রী ! ওহো ,ব্র্যান্ডের কি মহিমা !! This story is about Vaaman Avataar. Once King Bali, the son of Virochan and the grandson of Prahlaad and the great grandson of Hiranyakashyap, won Indra and other Devtaa and started ruling Swarg Lok. Now Bali liked Swarg so much that he wanted to live there for ever. His Guru Shukraachaarya Jee said to him – “You can live here for ever but you have to do 100 Ashwamedh Yagya for it.” Bali got ready to do them. He started his Yagya. He finished 99 Ashwamedh Yagya and now he was proceeding to do his 100th Yagya. 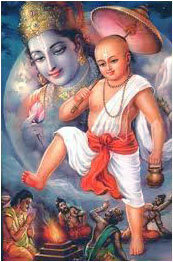 Then in an auspicious Muhoort Vishnu appeared as Vaaman Avataar (dwarf) of 12 years of age in Aditi’s house. All Devtaa came there to pray Him and offered Him something or the other. After getting ready Vaaman Bhagavaan set off to Bali’s Yagya. Bali’s Yagya was about to finish. Whatever Vaaman had to do, He had to do before he finished his Yagya. This is the specialty of the Ashwamedh Yagya that no beggar should go empty handed from the Yagya doer’s house and nobody should remain hungry in his kingdom. So taking advantage of this specialty, Vaaman came to the gate of Bali’s Yagyashaalaa and asked for a donation. As his people saw Vaaman Bhagavaan, they became mesmerized and just remained stood looking at the child’s beauty. When they came to their senses, they went inside and reported King Bali that a 12-year Braahman boy was standing at the gate and was asking for donation. The boy said – “Hey Raajan, I am a Brahmchaaree so I will not have any descendents. Besides a true Braahman should never think of tomorrow, that is why I want only three feet land.” Bali got silent hearing this reply and asked one of his attendants to bring him some water to read the Sankalp to donate three feet land to the boy. The attendant immediately brought the water and gave to the King. Bali was about to read the Sankalp, that his Guru Shukraachaarya stopped him to read the Sankalp. When Bali did not listen to him and started reading Sankalp, Shukraachaarya seeing no other alternative entered the spout of the pot from which Bali was pouring water so that the water does not come out and the process of donation is not complete. The water stopped coming from the pot. Bali got worried as what happened, his donation was not getting completed. Vaaman Bhagavaan knew that Shukraachaarya Jee had sat in the spout to stop water going through it. So He picked a straw and inserted into the spout saying, “It seems something has come in the way.” The straw pricked the left eye of Shukraachaarya Jee, and blood came out of his eye. His eye got spoilt and he left the spout crying with pain. As Bali completed reading his Sankalp of donation, the boy changed His form. He increased His body so much that His head started touching the sky. He measured the whole Prithvi in one foot, the whole Swarg Lok with His second foot and the whole sky was covered with His body. As His second foot touched the Brahm Lok, Brahmaa Jee got very happy to see it. He washed it with the water of his Kamandal and the water which flowed from washing it turned into Gangaa River. Seeing His this Roop Bali again got mesmerized and just stood watching Him closely with folded hands. He was not at all sorry for his action that why did he give Him the three feet land. He was continuously looking at Bhagavaan’s Roop and was overjoyed to see it. After measuring Prithvi and Swarg Lok with His two feet, He asked Bali – “Now where should I keep my third foot?” Bali smiled – “Bhagavan, You are the Creator, You are the Maintainer and You are the Destroyer, This all belongs to You. You gave it to me before, and You have taken it from me now. What do I have which I can offer you now? I have only my body, so please take this also. Measure your third foot keeping your foot on my body.” Saying this he lay down on the floor facing downward. Vishnu Bhagavaan got very pleased with Bali, He blessed Bali with immortality and said – “You are great, Bali. People will remember you for many coming Yug. You will be called Daanveer Bali. Since you lay down facing downward, I give you the kingdom of Sutal Lok. You go there with your people and live there comfortably. You will be given the status of Indra in next Manvantar.” Bali prayed Bhagavaan and went to Sutal Lok with his people. 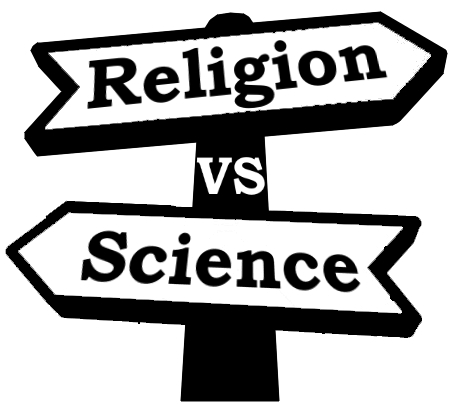 As I learn more about Science I tend to move away from religion. Religious text are very wrong about our natural world like Earth/Sun and Universe so if these books have no clue about our natural world then how we can accept the same to understand Supernatural powers like God. Is there any God or its just a delusion, a man made concept or just God of Gaps. Also what about Evolution vs Creationism? Evolution is widely accepted now and almost 100% Scientist back it. On the other hand Creationism is universal in all religions. Duryodhana seems to not care about the low birth of Karna and is the only one to vocally support Karna candidature in the archery contest without caring about caste inequality. When Kripa humiliated Karna in the martial exhibition, Duryodhana immediately defended Karna, and made him king of Anga. Karna pledges his allegiance and friendship to Duryodhana, as Duryodhana had rescued him from a source of continuing humiliation and hardship. Neither of them knows that Karna is in fact Kunti’s oldest son, born to (sun god) Surya. When Draupadi refuses to allow Karna to string the bod at her Swayamvara because of his low birth, Duryodhana defends him saying “great sages, philosophers, and warriors have no source. They are made great, not born great”. Another incident, is when knowing Sahadeva’s ability as an astrologer, Duryodhana asked him to fix Muhurtha time for commencement of war. He strictly adheres to his duties as a Kshatriya, and even in his last combat, fights bravely. He chooses to face Bhima in combat over all the other Pandavas, whom he could have easily defeated in war. Duryodhana was a skilled strategist. He managed to win the pledge of King Shalya, who was actually the maternal uncle of Pandavas, to fight on his side in battle of Kurukshetra. It so happened that while King Shalya was moving with his army to go and support Yudhishthira, he and his force were looked after extremely well en route. Floored by the hospitality, Shalya offered complete support to the host thinking it was Yudhishthira. Only later did he discover that Duryodhana was the person behind the hospitality, and was thus indebted to him. Duryodhana wanted Shalya mainly so that Karna would have an equivalent charioteer to Arjuna’s Krishna.